Four lifelong friends gather in the woods of western Maine for their annual hunting trip. When they were young, they were bound together forever by an act of bravery involving a fifth friend, whose influence has given these men special powers. Their trip is disrupted when a stranger, disoriented and delirious, wanders into camp, muttering about light in the sky. Before long, the friends find themselves pitted against an alien invasion and must draw on their old friend's strength once again to fight for their lives. 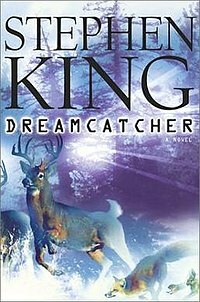 Fun fact: Dreamcatcher was written in cursive while Stephen King was recovering from a 1999 car accident. The original name was "Cancer" but his wife convinced him to change it. The main characters are from Derry. When Mr. Gray takes Jonesy to Standpipe Hill in Derry to deliver his deadly infection into the water supply, the alien is incensed to find that the Standpipe no longer exists - it was destroyed in the great flood of 1985. A statue commemorates those lost in the storm. The pedestal was drifted to most of its height in snow, but the top of the plaque screwed to the front was visible. Mr Gray fell to Jonesy's knees, scraped snow away, and read this: TO THOSE LOST IN THE STORM MAY 31, 1985 AND TO THE CHILDREN ALL THE CHILDREN LOVE FROM BILL, BEN, BEV, EDDIE, RICHIE, STAN, MIKE THE LOSERS' CLUB Spray-painted across it in jagged red letters, also perfectly visible in the truck's headlights, was this further message: PENNYWISE LIVES.